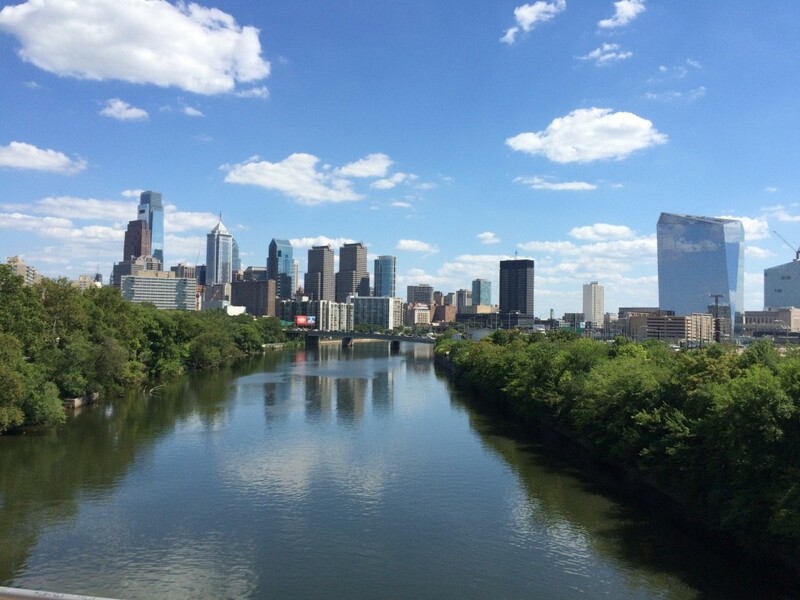 Ever thought about moving to The City of Brotherly Love? 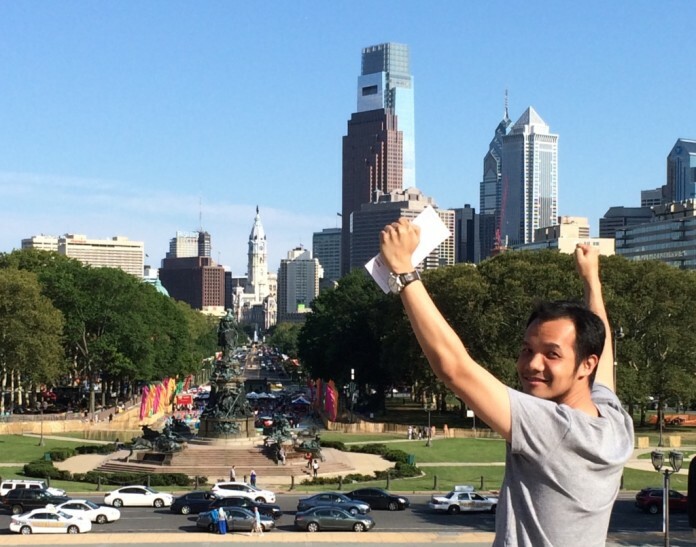 In this article, contributor Steffen Hadi shares his experience living in Philadelphia. If you do not want to miss out on the trending topic of global awesomeness, then come to Philadelphia (aka. Philly). The city’s football club (i.e. Philly Eagles) just won the Super Bowl this year and the basketball team (i.e. Philly Sixers) was considered as a strong contender this season. Those are all good, until the recent news about racism against two black people at Starbucks, one of the biggest coffee shop chains in Philly. It shook me to a point where I felt the necessity to write an article to maintain Philly’s good name as a city of brotherly love. Remember Rocky? (Feel the song humming in your head?) Yeah, Rocky Balboa is a fictitious boxing player from Philly who became a people champion in American boxing. It is told that Rocky’s grandparents are Roman-Catholic immigrants from Italy who made their way to Philly to seek a better fortune. Although fictional, the setting is inspired by true stories in Philly where everyone from all backgrounds can become something. It shows a true tolerance spirit in Philly where people respect each other and do not discriminate against each other based on race, religion, gender, wealth, or skin color. Rocky is just a simple illustration. Now, let me share my personal experience. For context, Philly is divided into several sectors, namely University City (West Philly), Commercial Area (mostly South and East Philly), Business Area (Center City), and Industrial Area (North Philly). City View from Schuylkill River. Photo by author. I came to Philly as an international student. It is obvious from my appearance, that I am an Asian—a minority in the USA. I would not boast the comfort that I enjoyed within the University City, as there are many international students from diverse backgrounds, thus not making me feel like an outsider. But as you get farther from the University City, the local atmosphere feels heavier. Uniquely in Philly, it is a friendly local atmosphere. Generally, the locals would greet you in the morning while you are doing your morning run or at least smile. There was an occasion where I got lost (and I think my face showed it all), and a local approached me in a friendly manner and asked me if I needed help. The atmosphere of tolerance can also be seen in December. The law school would not hesitate to decorate itself with both Hannukah (Jewish religious celebration) and Christmas decorations despite the fact that Christianity is the most prominent religion. Also, when the Pope visited, the city sterilized the City Center and town square for a full-fledged Catholic mass, and amazingly no concern was voiced for that. Thinking of the Philly cheesesteak? Yep, it originated from Philly, and it is just one of the good foods we can find in Philly. If you wish to have delicious lunch at fancy restaurants with more affordable prices, the city (and many other cities in the US) has a program named Restaurant Week. With a much cheaper price, you can have lunch in a certain restaurant at certain hours. If you are an explorer, try South Philly. It is a bit far from the University City, but the trip there is always worth it. You can find many Asian restaurants there from Chinese, Korean, even Indonesian food. I have a few recommendations for the foods all around the city. For Indonesian food, I would recommend a restaurant called Indonesia Restaurant. They have authentic rendang and other delicious Indonesian food there. Another recommended bite around the city center is Luke’s lobster. The lobster is good and the place is nice. Just make sure to order more than one lobster sandwich though. For cheesesteak, I would recommend Pat’s king of cheesesteaks. The place is managed by Pat’s family, who invented the Philly cheesesteak. However, there are many other good places to find Philly cheesesteaks nowadays, with quite the same taste as well. Sabrina’s café is the best place to do brunch. The toast here is unbeatable and the location is within the University City. Many college students would spend their morning here to taste Sabrina’s specialty at making breakfast. 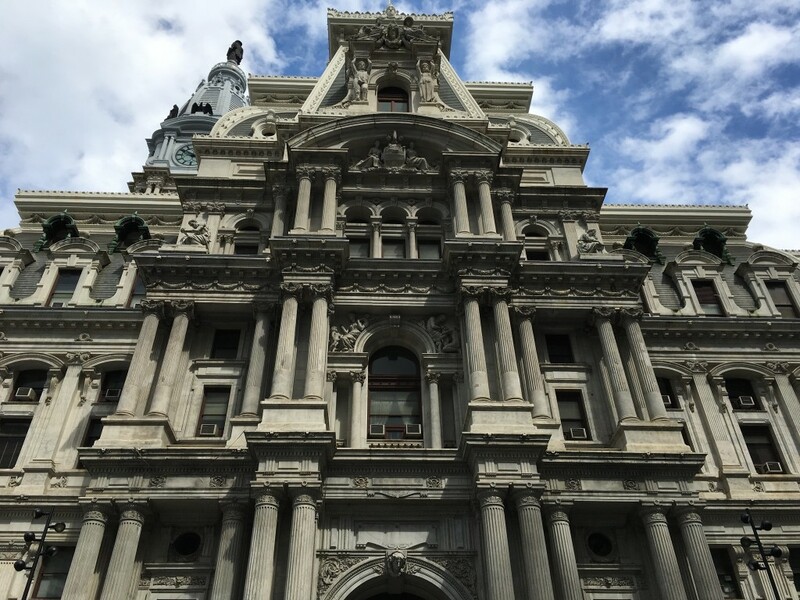 Philly’s City Hall. Photo by author. Philly has over three thousand murals featured on its city walls. Yeah, the government does not prohibit the creation of murals over the city walls as long as it is preceded by the required permit. Thus, many of the city walls are painted with beautiful street murals with meaningful messages, mostly about love between humans. The city also has a majestic museum named Philadelphia Museum of Art. With more than two hundred thousand collections ranging from Picasso to Rodin, this museum is the ultimate art powerhouse of the city. The museum tickets cost $20 for adults and $14 for students. Believe me, the museum is worth every penny. Did you know that Philly is the city where the American Declaration of Independence and Constitution were made? Or did you know that Philly was once the capital of the USA? Yep, this city is rich in historical value. To experience its rich history, we can go to the Independence Hall. It is a small town within the city which contains museums, historical buildings, and a number of other attractions. 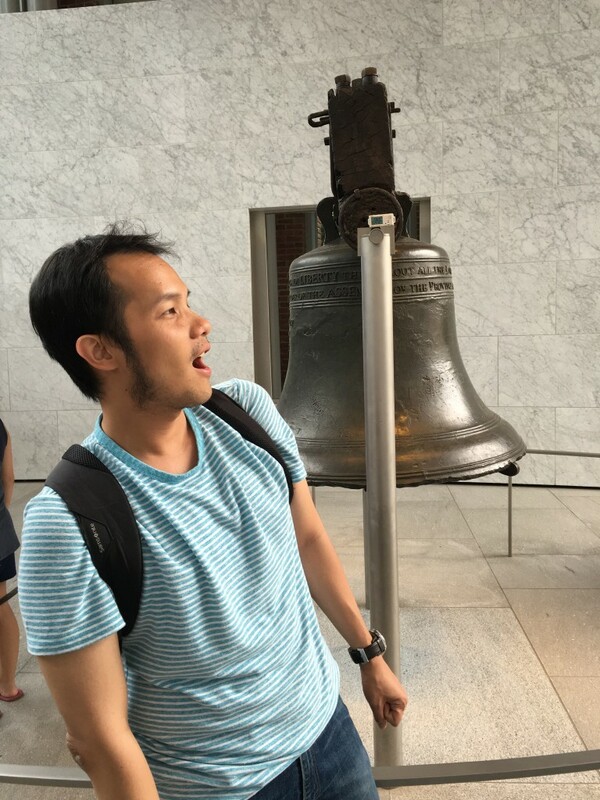 We can visit the building where the American founding fathers argued about the draft of the Constitution, and we can also visit the real liberty bell (but do not lick it like Barney did!). Don’t lick the Liberty Bell!. Photo by author. For me, it was between New York City (NYC) or Philly. Personally, I prefer a city with various traditional features without losing its urban atmosphere. NYC is totally urban, the city is packed with people and glamor. But that’s it, NYC is only about modern, metropolitan, and urban lifestyle. In Philly, we would not find it as metropolitan as NYC, but Philly offers a lot of other features such as clean air, pretty murals, good food, historical atmosphere, and above all friendliness. I would like to emphasize the friendliness of the city because I am the living proof to witness it. In Philly, there will be no people forcing you to accept a sample CD then ask you for money afterward (like I experienced in NYC). In Philly, I can jog from my dorm all the way to South Philly and received nothing but smile and friendly greetings from various people along the way. This is the real character of Philly. There is nothing near racism there, only brotherly (and sisterly) love. So, if you are looking for an answer in your contemplation, find it in Philly, guys.